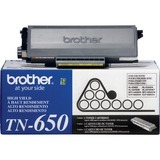 Enjoy high quality outputs with the Brother High-Yield Black Toner Cartridge. This toner cartridge produces rich blacks and subtle shades of gray prints for your documents with clear, crisp, and distinct characters with professional looking. It is designed to work well with Brother DCP-8080DN, DCP-8085DN, HL-5340D, HL-5370DW, HL-5370DWT, MFC-8480DN and MFC-8890DW printers. Plus, this toner yields up to 8,000 pages in a single cartridge. Acquire the Brother High-Yield Black Toner Cartridge now!